Thumb round at the base of the neck when in the higher positions. This allows the fingers to be over their respective positions for balance and sufficient arm weight. Why is it necessary to learn scales and arpeggios? Playing a stringed instrument requires a certain amount of physical dexterity and co-ordination. In many ways there are comparisons to other areas of the arts such as dancing. A dancer, whether modern or classical, must spend time ‘limbering up’ so that their muscles are stretched to take the strain of their particular activity. 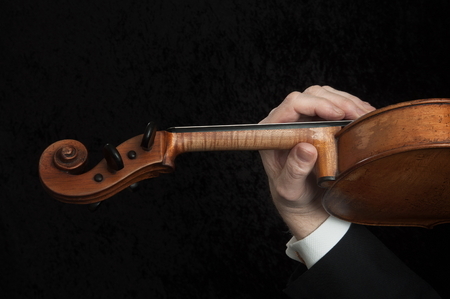 What string players can do, apart from some obvious forms of muscular stretching, is to warm up with scales. 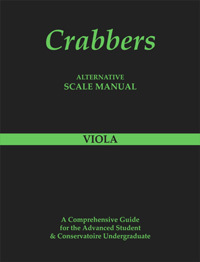 In other words, every time the viola is practised, begin with scales. 'Diarising’ each practice session is crucial and will pay enormous dividends. It is important to make notes on what has been accomplished, with bowings and tempo markings as well as recording what section of the key was covered. These are good and extremely productive habits. With less advanced students these areas might include double stop scales or a diminished 7th scale.With the diminished 7th scale it is easy to remember that the intervals are made up of minor 3rds. If the key is D then the notes would be D, F, Ab and C (being the flattened 7th). Remember also to concentrate on tone production, posture and most of all being relaxed.